The TM-Sidhi program is a natural extension of the TM technique and may be learned after two months of regular practice of the Transcendental Meditation. Practice of the TM-Sidhi program accelerates the progress of the individual towards realizing his full potential - the state of enlightenment. The Transcendental Meditation technique gives direct experience of the least excited state of consciousness, the pure consciousness, the unified field which is the total potential of Natural Law. The TM-Sidhi program trains the individual to operate from the least excited state of consciousness, to think from the level of the unified field of all the laws of nature. By learning to function from this self referral state of pure consciousness, the mind gains increasing support of nature for the fulfillment of desires. With the TM-Sidhi program, thought and action spontaneously become more in accord with the evolutionary power of Natural Law. This results in greater skill in action - the ability to fulfill one’s desires naturally while effortlessly promoting the evolution of everyone and everything. 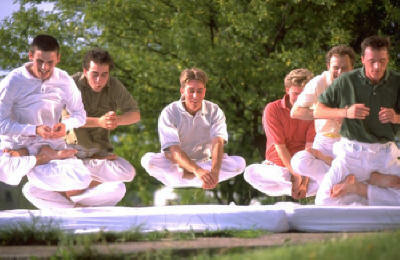 One aspect of the TM-Sidhi program is called Yogic Flying. During the first stage of Yogic flying, the body lifts up and moves forward in short hops. Subjectively one experience exhilaration, lightness and bliss. Scientific studies show that during this practice, at the moment the body lifts up, coherence is maximum in brain wave activity. This means that brain functioning is optimum and creates the perfect condition for the frictionless flow of awareness towards the fulfillment of its desire, in this case “flying”. When Yogic flying is practiced in groups, this influence of coherence spreads throughout the environment, reducing negative tendencies and promoting positive and harmonious trends in the whole society. For the schedule of the TM-Sidhi course, the date of the orientation meetings at which you can apply for instruction, and any further information, please send us an Email or call Maharishi Health Education Center, or contact your Local TM Center in Lebanon.